Another month has come and gone, my oh my. 2014 is surely slipping away.. 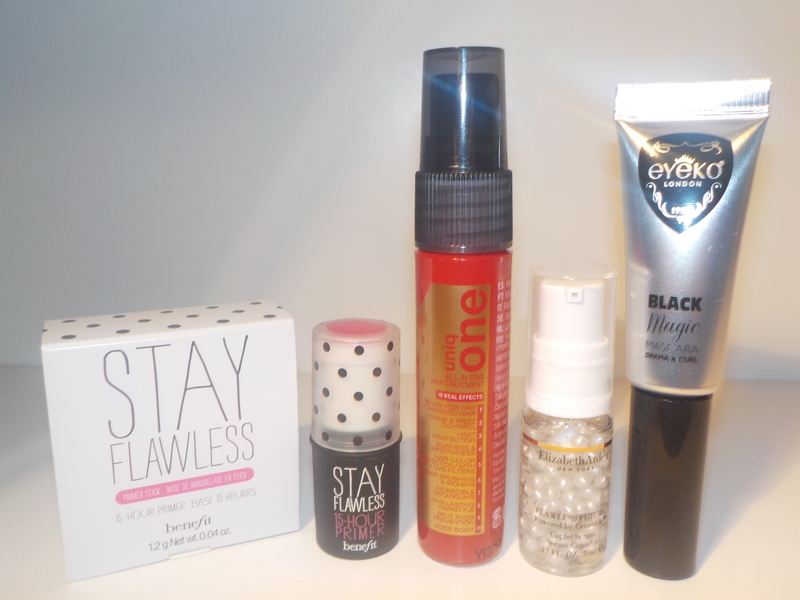 This month’s Topbox was pretty good as I would use all the products except for one as it is a repeat product. – I have seen this mascara around and have wanted to try it and now I finally can. – Unfortunately, this is a repeat product for me. I just received this in my October box, so this is kind of a bummer. – This seems like quite the product as it claims to have 10 positive effects on the hair: repair dry/damaged hair, shine & frizz control, heat protection, silkiness & smoothness, hair colour protection, easier brushing, detangling, long-lasting hairstyle, prevents split ends and adds body. The smell is a bit strong for me, but does provide a soft finish when used. – I have previously tried this product before from a tiny sample, but did not really see the results of a 15 hour primer. Since this sample is a bit bigger, I will definitely try it out again and see if I like it. As always, the Benefit packaging is so pretty! What did you receive in your November Topbox? What are your thoughts? I got an email from Topbox saying they lost the shipment of Alberta’s boxes (I live in Calgary). STILL waiting on my box! Wow that is unbelievable. How does that even happen?! Hopefully you get yours soon! The mascara looks so interesting! Definitely not the packaging I’m used to!